We’ve been lucky enough to sample some of Riverford’s amazing dairy produce. The selection of Riverford’s organic whole milk, semi skimmed milk and skimmed milk was delicious. We enjoyed it fresh in the morning on our museli with a side of hot milky coffee and in the afternoon with a cup of English Breakfast tea. At only 99p per litre Riverford organic milk is great value and healthy for the whole family. The whole yoghurt and fat-free yoghurt tasted delicious with a fresh fruit salad and I enjoyed it as a quick and convenient snack during the day with a sprinkling of sunflower seeds. Our baby loved the creamy whole yoghurt after her dinner in the evening, full of goodness and flavour. The Riverford clotted cream fudge was, dare I say more! Fantastic as a gift or as an indulgent treat for oneself. Riverford butter is deliciously creamy and it stayed semi-soft in the fridge, making it wonderfully convenient for spreading straight on to fresh bread or toast. We enjoyed it on crusty fresh bread with Leek and Potato Soup and used it in cooking to bring out the full flavour of vegetables. Riverford work with small-scale producers who care about their animals. They won the RSPCA Good Business Awards 2011. Find out more about Riverford animal welfare and don’t miss the incredible video of their cows bounding into the field at the beginning of Spring. It was reported in the The Telegraph on 2 December 2011 that Vitabiotics Pregnacare Conception tablets may improve the chance of pregnancy in women undergoing fertility treatment. Findings showed women were twice as likely to conceive when taking Vitabiotics Pregnacare Conception tablets, as opposed to just taking the recommended dose of folic acid. 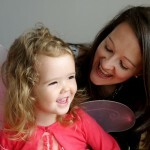 The study involved 56 women attending University College London and the Royal Free Hospital fertility units. The findings are published in the Reproductive Biomedicine Online Journal. 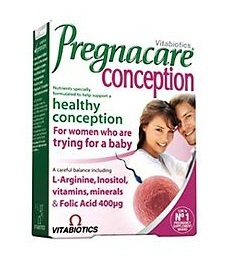 I personally used Vitabiotics Pregnacare Conception tablets when we were trying to conceive, you can read more here… Trying for a Baby? We have been feasting on the freshest and tastiest organic fruit and veg this week, thanks to Riverford. 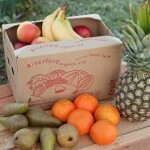 Our Riverford fruit box and veg box surpassed all expectations. The boxes provide a diverse and plentiful supply of fruit and veg to snack on and to turn into culinary delights for all the family. Riverford began a delivery service around 25 years ago when Guy Watson, founder and owner of Riverford farm in Devon, started delivering fruit and veg boxes to his local friends. Today Riverford delivers around 40,000 boxes a week to homes across the UK from their regional farms located in Cambridgeshire, Yorkshire and Hampshire. As well as organic fruit and veg, Riverford also produce organic food essentials such as meat, cheese, eggs, bread and cereals. The taste and freshness of the fruit and veg was second to none. I usually buy organic veg from two of the major UK supermarkets and I can say there’s no comparison with Riverford’s produce. There’s something about eating fruit and veg that’s just been picked, with no cold storage involved and minimal transportation. We really liked the addition of the Riverford Recipes fold-out card in the boxes. These contain delicious recipes for using with the fresh produce included in the box and can be kept in a recipe folder for future reference. Our family has enjoyed some great meals using the veg box ingredients, along with a hearty Leek and Potato Soup and a no-pastry Pumpkin, Sprouting Broccoli and Leek Quiche. We’re making the most of the fresh organic fruit, eating it with our breakfast, throughout the day as healthy snacks and in the evening chopped up roughly as a fresh fruit salad. For a great family day out, you can take the children to visit Riverford farm and see where the veg is grown. While you’re there you can enjoy freshly cooked produce at the Riverford Field Kitchen restaurant which is open daily. Riverford’s fruit and vegetables were delivered to my door by our Riverford local vegman who delivers the veg on a set day to maximise efficiency and reduce food miles. The fruit and veg were wonderfully presented in boxes, looking so good I wanted to try them immediately. 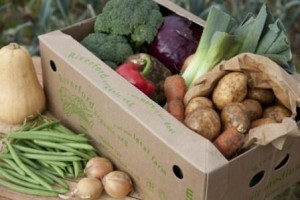 Why not try a Riverford veg box for you and your family, delivery is free with all Riverford box orders.